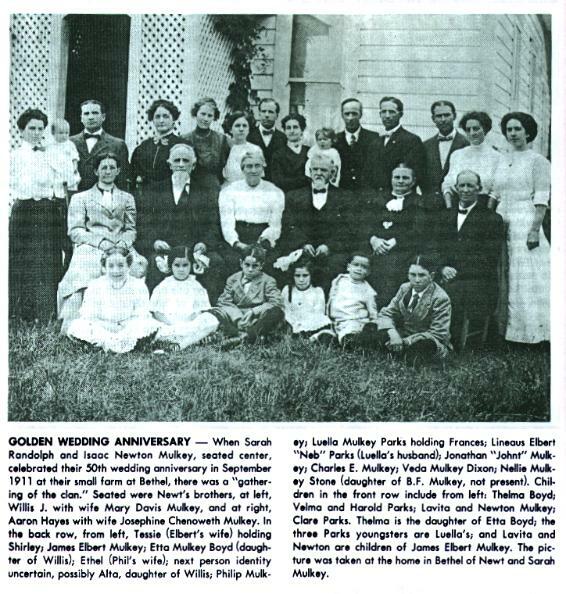 Isaac Newton Mulkey was a grandson of John Mulkey, the man who broke with the Stockton Valley Baptist Association in 1809. He carried the Newton middle name because John Newton had converted his great great grandfather, Philip Mulkey, to Christ. There were other Mulkey men with Newton in their name. I. N. was the 12th among 14 children of Jonathan Howard and Talitha Hardin Mulkey. He was the first among his brothers to emigrate to Oregon. When he was about nine, his family moved to Illinois and settled near Mulkeytown. He was apprenticed to a blacksmith and developed in that trade. He married Sarah Frances Randoph and lived for a while in Carbondale, Illinois where their first son, Benjamin Franklin, was born. Later he moved to Missouri where he successfully combined blacksmithing with farming. After the transcontinental railroad was completed, he brought his family to San Francisco and then to Portland by boat, then to Eugene by steamer. They first stayed with uncle Philip in Eugene, then moved east of Eugene to Pleasant Hill. Sarah was expecting their fourth child, Philip James, and was depressed to the point that she wanted to "go back home to Illinois." In Pleasant Hill, I. N. built a nice home, a blacksmith shop, a separate building to manufacture buggies and wagons, and another building for a grist mill. It was powered by a water wheel. During these successful years, I. N. Mulkey developed the urge to learn the Word of God and proclaim it. He began circuit-riding to other Lane County churches, including Irving, Halsey and Dexter. This was about 1875. When most of the children were grown, they moved to either McCoy or Bethel. (They are very close to each other.) This was about 1898. They lived on Mulkey Lane, although there is no such road there now. His youngest daughter, Veda, remembered dad as a man who loved to tell stories and laugh. Their son, Elbert and his wife Tess, joined them on the farm and the Senior Mulkeys were able to savor of their grandchildren growning to adulthood. The grandchildren included Newton, Lavita and Shirley. A photo was taken of their 50th wedding anniversary celebration and can be seen on this local link. Eventually they returned to Pleasant Hill. I. N. came to the end of his days in 1917 and was buried in the Pleasant Hill Pioneer Cemetery.